A Look at the 2016-17 Barrie Colts after 10 Games. #OHL - Very Barrie Colts | A website covering the Barrie Colts of the OHL. The Barrie Colts have finished the first 10 games of the 2016-17 season with a losing record. In this post we are going to take a look at how the team has looked through these first 10 games and compare it to how they looked at this point last year. 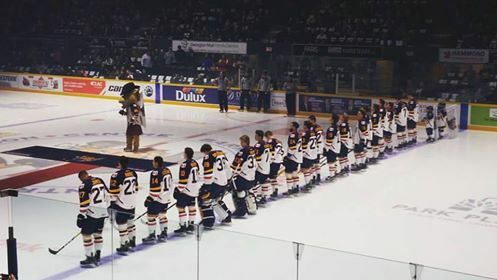 The Barrie Colts have a 4-5-1-0 record through the first 10 games of the 2016-17 OHL season. Last season at this point they had a 6-4-0-0 record so, though it may seem that the team is struggling, they are not far off from the start they had last season. The 9 points they have this season is enough to have them in 2nd place in the Central Division. 9 points in any other division would have them in the bottom 2 teams in that division. The Colts no doubt are lucky that they are in the Central but will need to have a winning record moving forward if they want to possibly contend. 2 seasons ago the Colts had a 6-3-1-0 record through the first 10 games. The Colts have scored 29 goals and allowed 35 goals against. Last season, Barrie scored 28 goals which was enough to have them as the 4th highest scoring team in the OHL. This season with 29 goals they 5th fewest. Clearly goal production is up early this season from last year. Of the 29 goals scored, Captain Cordell James leads the way with 6 goals. Barrie has allowed 35 goals against so far. That is 10 more than the 25 that they had allowed at this point last year. This year, 7 teams have allowed more goals than Barrie with several also allowing 35 so far. Middle of the OHL pack as far as goals allowed is concerned. Barrie has a gone 8 for 59 on the power play this season which is the 13th best league wide. Not terrible considering the team went 9 for 47 at this point and 13 for 52 the year before. That season was higher because Brendan Lemieux was scoring PP goals like it was nobody's business. Penalty Kill has been fairly strong only allowing 6 goals on 57 short handed chances which is the 3rd best PK in the league. Last year they allowed 3 goals on 40 penalty kills which could have been attributed to the work of Mackenzie Blackwood. Courtesy of the Official OHL website. Everybody has kinda understood that this was going to a rebuild year for the team. Losing the top producers and starting goalie is a tough adjustment but I feel the start to the year hasn't been bad. Initially I felt the production so far has been down from last year but looking at the numbers, the team has managed to do a decent job so far this year. Areas of improvement would be to work on the Power Play. If the team could find a way to take advantage with the extra man it would give the team a real edge. The team is shooting the puck more which is very important and will need to keep that up as the season progresses.